What better surprise could your brother receive on the auspicious day of Raksha Bandhan, than a beautiful package of Rakhi and Cookies? If you were not able to make the design Rakhi on your own, you can compensate for that by sending these cookies, which will smell like home. Your brother thinking that this year he will not be receiving a fancy Rakhi thread from you will be blown away with this surprise gift. This combination contains a combo box of delicious handmade cookies with flavour options like butter, chocolate chip, fruit and many more. If your Bhaiya has a sweet tooth, he will definitely enjoy this gift from you. The cookies are from reputable bakery and assure of excellent quality at our shop. 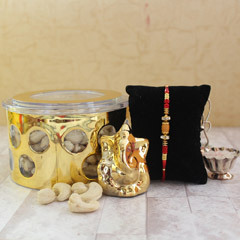 At Sendrakhi.com, you are getting free shipping and delivery with your purchase. This saves you from the hassle of undergoing the complicated procedures for international courier services and paying heavy customs. We have a prompt online delivery team who are highly efficient and are willing to work even at midnight so that your gift reaches the required location on time. If you want the package to reach a selected location where we offer same-day delivery, you will not be late when you wish him “Happy Raksha Bandhan” with the Rakhi and Cookies you buy from us in a traditional way.